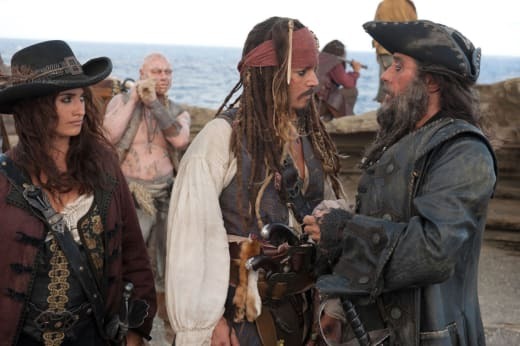 New beginnings are always a great way to revamp a dwindling franchise -- and that's just what Pirates of the Caribbean: On Stranger Tides did. Audiences who are fans of the first three films won't be disappointed with this brand new storyline, despite the fact that many new characters are introduced, including Angelica played by Penelope Cruz. Johnny Depp returns in his most iconic role as the lovable Captain Jack Sparrow and he delivers a memorable, if not, predictable performance. But that's why audiences keep coming back for more Pirates. In this one, Captain Jack is on a mission to find the fabled Fountain of Youth. He is, again, in London looking to put together a crew. He is caught by the British guards and forced to sit in front of King George II (Richard Griffiths) to await his fate. The banter between Jack and King George II is quite entertaining. All Sparrow is worried about is getting a bite of the delicious pastries on the table, even though his life is threatened - it's a great opening scene. 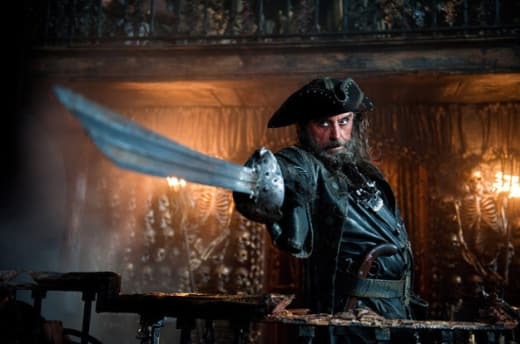 He eventually escapes, after a long cat and mouse chase, when he runs into an old lover, Angelica (Cruz) who forces him onto the infamous death ship of the evil and deadly Blackbeard. He spends the rest of his time on the ship and in the tropical forests leading the deadly crew to the Fountain of Youth (of which he doesn't exactly know the location). One of the main elements needed for the Fountain of Youth is a mermaid tear. The mermaids are everything the previews promised and the battle between these beautiful creatures of the sea and the pirates is quite exciting. Directed by Rob Marshall (Chicago), On Stranger Tides goes back to the simpler plot of the first (and best) Pirates film and it creates a very enjoyable viewing experience. Depp is still as entertaining as ever and he plays the role with such conviction, you can't help but love him. It's nice to see the new characters, which gives it a completely fresh appeal and creates a fun adventure. Cruz is good as Angelica, but her lines come across as a little forced and she doesn't have the same right charm to really jest with Depp's Sparrow. She just isn't on the same level as Jack and it's not a fair battle between the two - in both wit and power. We also see the return of Captain Barbosa (Geoffrey Rush), who is back to being Jack's ally, rather than foe -- and the two have some great scenes together. 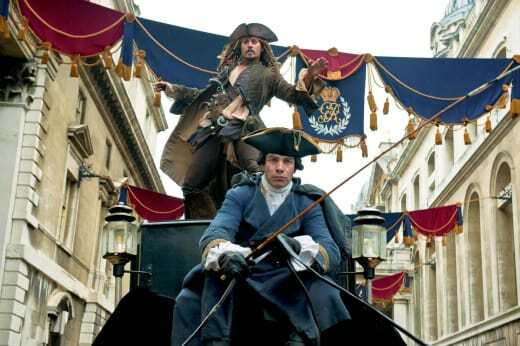 They are both on the same page when it comes to Blackbeard and it brings a fun chemistry to their roles. I love that the film goes back to its roots and keeps things much simpler than they had been in the past and I think it really allows audiences to sit back and enjoy the adventure, rather than have to try and figure out what's going on at every turn. The ending implies there is room for another and if they can keep coming up with unique adventures with new and entertaining twists, this franchise could go on for another couple of films and still be relevant and fun.